Other than Luke climbing the walls from boredom (rained on and off today) - I did take some time out to make some cards I am sending friends interested in Stampin' Up!. These will be part of the Christmas Countdown too - so consider this one a sneak peek!! 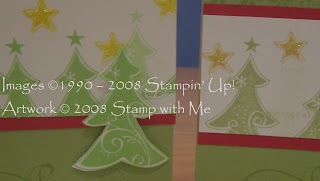 I used the Season of Joy set from the 2008 Stampin' Up! Spring Mini Catalogue. This set of 8 stamps can be used in so many ways and styles - even for projects that are unrelated to Christmas. Imagine that! As you can see I background stamped directly on the card. I then used 2 colour ways. The first card uses Green Galore and Yoyo Yellow. The second card used the more muted colours of Certainly Celery and So Saffron. It's amazing how even the slightest colour variation makes a difference to the card!